- Do not be happy with the minimum (Christianity is not for the mediocre life). -	To go to far of places, unknown places to do God’s work. -	Duc in altum… cast into the deep; go beyond our comfort zone. -	Put out into the deep with trust in God’s Word and miracles will take place. -	Peter called others to help- collaboration in doing God’s work- never alone but with the community. -	Collaborators also felt the sense of unworthiness for this big tasks and the way the Lord worked in them. No task is so big for God…it can all be taken care of – we need to only put our trust in Him. -	We get encouragement to carry on our work even in midst of failure of any kind. -	Any tasks given to us by the Lord with His assurance will multiply our success. -	When God enters into our lives, especially our brokenness, our disappointments, our tiredness and the different failures that we experience and transforms it for us, we have to feel the sense of unworthiness, especially the feeling that I can do all things and do not need His grace and blessings in our life. -	When we place all our trust in Him and in all that He tells us to do, even the un-thinkable, miracles will follow and the best of miracles that can ever take place in our lives is: we will surely follow not just His instruction…but HIM. A French monk Dom Chaitard use to say: to make any effort without union with God was largely futile. The disciples today discovered the truth of Dom insight. They have been laboring the whole of the night, with the best of their fishing skills, and had caught nothing. They were experts. They had been fishing the same waters for years and years. They knew every pattern of the little fish who inhabited the lake. They were aware of the best moments of temperature and time to make their casts. They still caught nothing. They had labored by themselves, without Jesus. When Jesus came long later in the morning, a terrible time to fish, and suggested that they make another cast, they must have thought him to be terribly naïve. Reluctantly they put out their nets, in obedience to Jesus, and are surprised beyond their wildest dreams. Isn’t it amazing what we can do when we are in union with Christ? -	They experienced this in their professional life. -	Failure is part of human growth, we achieve because of failures. -	Jesus did not help the frustrated disciples immediately. -	They had already washed their nets. -	To witness any miracles we need to first listen or Hear the teachings of Jesus. -	God works at His own pace. We cannot expect or force God to work at our pace. In His time, at His convenience, He will succor us. -	Peter obeyed: Put out into the deep water and let your nets for a catch. Peter as a professional fisherman knew more than Jesus (carpenter), that it was useless to go for fishing in the morning…..
-	Peter does not go by his professional experience; instead he listens to Jesus and obeys Him. He said to Jesus: “Nevertheless at Your Word, I will let down the nets”. -	That morning, obeying Jesus’ command made the difference between failure and success in Peter and all around him. -	The disciples worked hard, but they failed. When they obeyed Jesus’ word they succeeded beyond expectations. As Christian we are called not to be at the shores of our lives (comfort zones, happiness or even at our failures in life), but to go out into the deep. A ship was not meant to be at the shores but into the deep sea to be guided by the captain. REFLECTION 2: THOUGH UNWORTHY, HERE I COME LORD! Today’s first reading from Isaiah speaks of the call of the prophet and has all the elements of a Christian vocation: an experience of God, the awareness of one’s unworthiness, God’s reassuring action, the commission for a task and the individual’s acceptance. Every calling begins with God revealing himself to us and that experience leaves us with a sense of awe and reverence. “Holy, Holy, Holy, is the Lord God of hosts, the whole earth is full of your glory! Together with this sense of awe is the accompanying awareness of one’s unworthiness. Isaiah was overwhelmed by his personal unworthiness. “Woe is me! I am lost, for I am a man of unclean lips, yet my eyes have seen the Lord of hosts!” On confessing unworthiness, God takes the initiative and sends one of his seraphs to take the coal burning at the altar to cleanse Isaiah’s lips, thus Isaiah was symbolically purified to be worthy of his calling. It is only then that the Lord asks: “Whom shall I send?” and Isaiah generously responds, “Here I am send me!” Have we answered God’s call? In the second reading we have a second story of a vocation. Paul acknowledges the basis of his calling as an apostle of Christ Jesus. “Last of all, as to one untimely born, Christ appeared to me.” As in the case of Isaiah, Paul, when he is called, is acutely aware of his unworthiness. “For I am the least of the apostles, unfit to be called an apostle, because I persecuted the church of God.” But Paul is certain of the mercy and grace of God and his power transforming him. “But by the grace of God I am what I am, and his grace towards me has not been in vain.” It is because of God’s calling that he is ready to proclaim the good news of Jesus Christ. In today’s gospel passage from Luke, we read of another story of the vocation of Peter and the apostles and we see how no two vocation stories are the same; God calls different people in different ways. Whereas Isaiah encountered God and received his calling in the temple, Peter encounters the Lord in a different setting. We are told that Peter and his companions had returned after a night of futile fishing and are washing their nets. Jesus was there by the lakeside and requested permission to use their boat as a platform for his preaching. 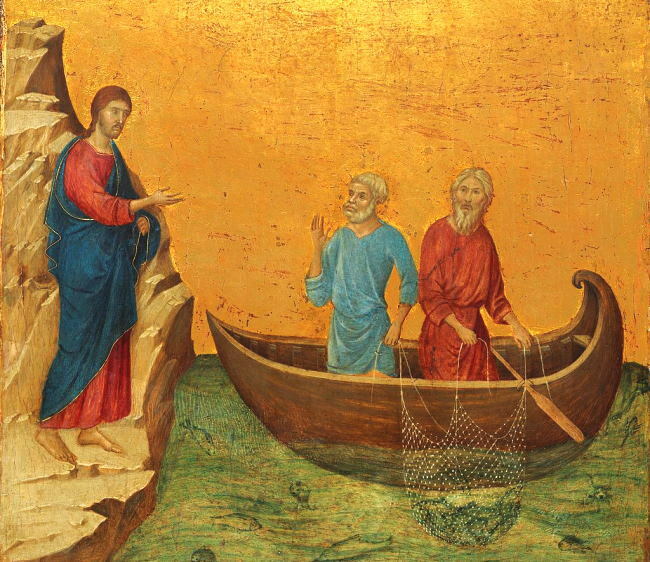 After preaching he asked Peter to launch out into the deep. Peter had several reasons not to do so. He was the fishing expert while Jesus was the preacher. He knew the lake like the back of his hand; Jesus was a mere carpenter. He had spent the whole night and caught nothing; there were no fish to catch. He and his companions had laboured the whole night and they were tired and now Jesus was asking them to launch out again. He could have said, “Not now, some other time!” But Peter said, “If you say so, I will let down the nets.” And they caught so many fish that their nets were about to break. In spite of having every reasonable reason not to do so Peter obeyed the command of the Lord and was rewarded with a miracle. He immediately recognized that this was not normal, this was not a chance happening, a fluke; this was the hand of God at work. We could apply several insights from this episode to ourselves. As He came into the life of Peter, God often comes into our lives while we are caught up in the midst of our routine humdrum thankless tasks of daily life. We don’t have to necessarily go to the Church to find God; often it is God who comes to us. Secondly, just when we feel that our day has been fruitless or work has been futile and we are ready to give up, we may be on the verge of meeting our God if we persevere and continue. It is not multiplying our efforts that guarantees success but doing what the Lord asks of us. “If you say so, if this is what you want, I am ready and willing.” God often speaks to us through people who, we may feel do not have the knowledge, the experience and the expertise that we have. We may believe that we know better but God knows best and works in all things to our advantage if we are ready to let him take charge. Faith is not doing what is reasonable, but doing what He wants. The Gospel tells us that the moment Peter experienced the extraordinary catch of fish he immediately realized that he was in the presence of the Lord. While acknowledging the Lord he also was aware of his own sinfulness. He fell at Jesus’ knees saying, “Go away from me, Lord, for I am a sinful man!” It requires faith to see the hand of God in the events of daily life. Sometimes we can get so used to the gifts that God showers on us that we either take them for granted or come to believe that we deserve them or have a hand in their happening in our life. “I got this promotion because I worked hard for it and deserved it.” ” Mine is not a chance success, I have been planning for it and working towards it.” The person of faith is able to see God’s hand at work even in the routine events of daily life and feels everything is a blessing and a gift. For the faith-filled person miracles happen everywhere, to those who do not believe, no miracles are possible. The last part of today’s gospel tells us that after Peter acknowledges his sinfulness and unworthiness Jesus affirms his special mission. “Do not be afraid; from now on you will be a fisher of men.” Each encounter with God only confirms God’s goodness and our unworthiness. The Good News is that while we are bothered by our past, God is concerned with our future. While we are caught up with our failures, God sees the potential of success that is ours with his help. All that is required is the acknowledgment of our sinfulness for the Lord to take over our lives. Unfortunately, we interpret God’s word to suit us rather than transform us. This entry was posted in English, Fr Franco, Ordinary Time, Year C. Bookmark the permalink.